Understanding and Benchmarking the Membership Preferences of Millennials and Generation Z: They’ll be 70 percent of the workforce in 2 short years. Is your organization ready? 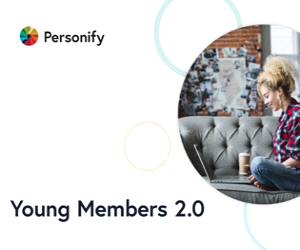 In December 2018, Personify surveyed more than 1,000 association members in the United States to expand their understanding of young members and find out what their perception of membership is, what compelled them to join their organizations, how they engage, and why they allow their memberships to lapse at such high rates. This report reveals their findings and provides extensive insight into this significant aspect of the future of membership organizations. Expand your own knowledge of young members and ensure that you are growing, engaging, and retaining those memberships by downloading this report today!